Christmas certainly came early for one lucky slots player at BGO Vegas. 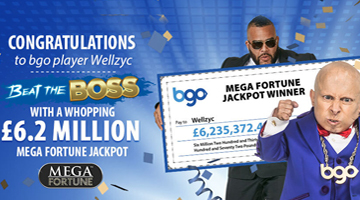 The player, Wellzyc, won the massive progressive jackpot prize whilst playing the legendary NetEnt Slot, Mega Fortune. This was the biggest jackpot win of all time at BGO Vegas, and will be life changing for the lucky slot fanatic. “When I saw the amount that I had won I was in shock and disbelief and wasn’t sure how to react. The win is life changing for me and my family and given us security for the future. You can read our review of the Mega Fortune Slots game on the Offersville games pages. Join BGO Vegas through Offersville today and get 200 Free Spins and up to £1,500 bonus money. This game has become one of the most popular slots of all time thanks to its massive progressive jackpot payouts that makes millionaires of players on a regular basis. The tension-filled bonus round features three concentric wheels and three potential progressive jackpots, The Rapid, The Major and The Mega. With each spin of the wheel a player can win a cash prize, a jackpot, or move on to the next wheel. The game is available on desktop, mobile and tablet. If you’re feeling lucky this Christmas we recommend you play Mega Fortune Jackpot today.